Enjoy the health benefits of elderberries in this late summer treat – homemade elderberry ice cream! It may still feel more like ice cream season than cold and flu season, but now is a great time to start building up your immune system. 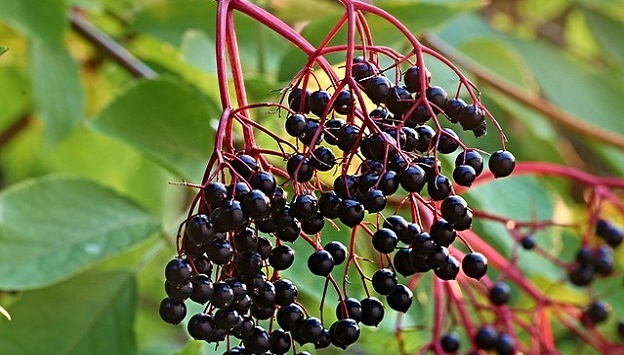 One tried-and-true immune-boosting remedy is elderberry syrup. While you can purchase elderberry syrup, it is quite expensive, and it’s relatively easy to make your own – especially if you live somewhere where elderberries grow wild, which is most of the Southern, Central, and Eastern U.S..
All kidding aside, while I wouldn’t claim that ice cream is actually a “remedy” for anything, if you’re going to eat ice cream anyway, why not make your own using ingredients that may actually offer some health benefits? Stir all the ingredients together in a bowl, then pour them into a prepared ice cream maker. Let the machine run for 15-30 minutes (depending on your machine’s directions), or until the ice cream starts clumping and building up on itself. Then, scoop your ice cream into a container and pop it into the freezer for at least an hour to firm up. If your ice cream is frozen very solid, remove it from the freezer to soften slightly about 10 minutes before serving.